As part of the Keeping It Living Campaign Project Watershed held a bird walk Saturday the 4th of May. 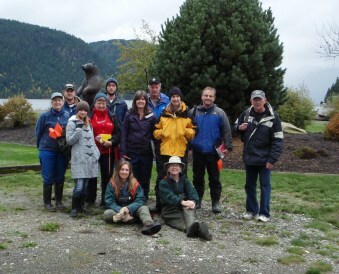 The walk was led by Art Martell, a well-known birder in the Comox Valley. He took the group to a hidden estuary habitat teaming with birdlife right in the middle of the day, a stone’s throw away from the hustle and bustle of the Dyke road! Participants of all ages enjoyed the one and a half hour outing. Highlights included Great Blue Herons, Green-winged Teal, Red-winged blackbirds, Killdeer, Long-billed Dowitchers and Sandpipers. Many of the participants were surprised at the wealth of birdlife and quality of habitat they were shown. While our Estuary has been degraded over the years, pockets of healthy habitat still exist. The slough and wild habitat the group visited is in an area established and protected by Ducks Unlimited and The Nature Trust of British Columbia. Supporting and expanding these areas through restoration, land acquisition and other protection measures will help return the abundance that was the namesake of the Comox Valley. Project Watershed thanks Art Martell for sharing his knowledge and enthusiasm for Estuary habitats. Walks like these and the other work that has been going on in the Estuary highlights how various environmental groups are working together to educate about, protect and restore a natural system. The next event in the Keeping It Living series is entitled Mudflats Mischief. It will take place at 1pm on Saturday May 25that the Courtenay Riverway Walk. You can find out more about this and sign up online at http://keepingitliving.ca/projects/event-sign-up. The Keeping It Living Campaign also features a silent art auction and competition – to view the art, vote or bid visit www.keepingitliving.ca.